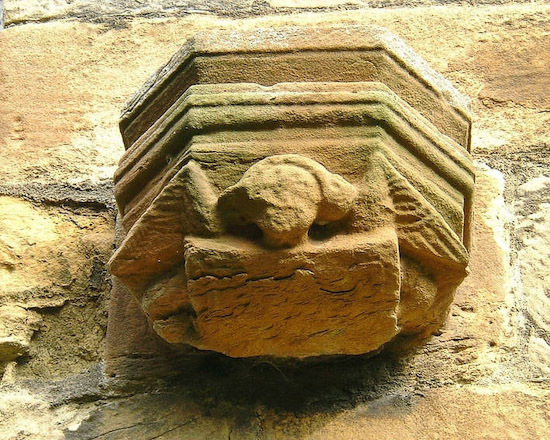 In common with virtually all of the church buildings of the period Seaton Collegiate Church has some angels and whilst they are nowhere near as frequent as those at Rosslyn Chapel those at Seaton have an interesting commonality. As one can see this angel is badly eroded yet the general outline and therefore the symbolic message is still clear. The angel, the messenger of G-d, is carrying a book – meaning the Word of G-d. This symbol has several layers. As it is on the outside of the building it is announcing to all that the building is a place in which to hear the Word of G-d, that Angels are his messengers and that the Word is contained within THE book – the Bible.